New solar energy systems have arrived to the south-eastern region of Puerto Rico. Founded by sugar cane workers, The Coquí community is located in the municipality of Salinas, have long sough to become energy-independent. This side of the main island offers stunning ocean views and coastal landscapes, but also has the largest power production center in Puerto Rico. Formerly a major sugar cane production site, Salinas now hosts the Aguirre Thermoelectric generator next to the Jobos Bay, an ecologically sensitive estuary. Local community efforts have long acted as a counter-force, seeking ecologically-friendly alternatives to the social and economic development of the Jobos Bay area. One of these initiatives, IDEBAJO, serves as a facilitator among several nearby communities, promoting community participation in the growth and sustaintability of the local economy. We broke ground in the south-east of Puerto Rico. Three community centers in Maunabo and Naguabo will receive solar power this month, thanks to our generous sponsors. Other similar installations in sites all over Puerto Rico are under way as well. As we approach the 6-month anniversary of hurricane Maria's landfall, followed by periods of shortages, numerous power outages & historical coastal waves, we celebrate these seemingly small victories that make the communities of Puerto Rico more and more resilient. Stay tuned for details! Casa Pueblo is a community project that is committed to the conservation of natural, cultural and human resources. For some years now they have pushed for a shift towards renewable energy and now they are one of the first town to have a Solar Barbershop, a Solar Radio station, and soon a Solar movie theater. We installed our first set of solar generators at three of El Caño Martín Peña's community center, a region of San Juan where over 25,000 people reside. 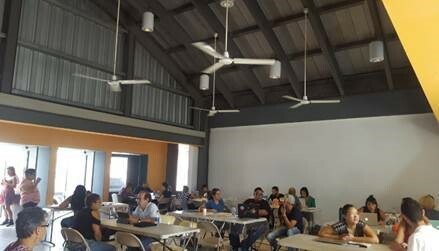 In this community, many residents lost their roofs due to Hurricane Maria and these energized community center served as important meeting points and strategic communication outlets for the re-organization the community. We continue to map out strategic points for the next wave of installations. Pilot Project: Installation of solar panels at el Caño Martín Peña. GIVING TUESDAY IS HERE! #UNDIAPARADARPR ES HOY! #GivingTuesday is a global day "fueled by the power of social media and collaboration". Following the steps of www.givingtuesday.org, RPPR is joining this charitable season focused on Puerto Rico's need of power after Hurricane Maria's passing over the island. Giving Tuesday for Puerto Rico is as well #UnDiaParaDarPR, a day where many organizations and non-profits like RPPR provide relief to the scenery left by the hurricane. The power of giving is the power of enlightenment, of joy, of placing a smile on those in need. The case of Puerto Rico has been devastating and as of today 3 months have passed and still more than half of the island remains without power, a large percent without potable water and the holidays are here. Darkness is upon Puerto Rico but with your donation, RPPR can provide resilient power with a strategic planning of locating solar panel grids in places unreachable by the Puerto Rican Electrical Power Authority and communities with extreme needs. To the date, we have installed 3 working sites and still growing! Your donation, which is tax-deductible, will contribute to reaching the goal of installing 100 sites or as many locations as possible. This day you can be part of a change. Today, you can place a smile on the faces of many PuertoRicans. Hurricane María struck us 2 months ago today. Electrical power is slowly coming back to the San Juan Metro Area, lighting up neighborhoods unexpectedly only to collapse back again into another uncertain blackout. Things are certainly not easier for nearby towns, and for more remote areas of Puerto Rico, it’s a daily struggle against despair. Meanwhile, our Resilient Power PR Team has been busy identifying new potential sites for solar power. We have been in several municipalities in the eastern and south-eastern sides of our Island. Our sponsors have been busy too, as they generously pledge funds for new installations. They also have provided us with contacts for several communities and non-for-profit organizations that are in need of electrical power in their humanitarian efforts. So, ¿where is our next installation is going to be? Several sites look promising. But today, let’s take a look into Loíza, a municipality minutes away from San Juan, but historically isolated from it. It is one of the poorest towns in Puerto Rico, but it has a rich and distinct cultural heritage. Both hurricane Irma and María caused significant damage, and left hundreds of families homeless. Education and schooling is also in decay, as many family’s economic needs drive students away from pursuing goals beyond high school. Some even abandon the school altogether. That is why we want to power the town’s public library. It is a small building in the center of the town, right across the main public square. It is a meeting place for students after school, and very accessible for locals. We have already visited the site with our electrical consultants, and have greenlighted this site. We are currently coordinating efforts with the local government to start our works. I want to share with all of you a a couple of pictures of what the office is doing now through the Resilient Power PR Initiative. As you may know, last week was very exciting, as we powered our first 3 community centers with solar energy! I still can’t get over the amazing fact of how lights and fans in those Community Centers sprung to life, without that unbearable noise of a generator. The community leaders were grateful beyond belief. Hopefully, this is only a taste of what’s to come. By end of day tomorrow, in exactly a week's time with only a few days notice, we will have built from scratch three beautiful small site 20 solar panel installations in Caño, the poorest community in the San Juan metropolitan area. Walter Meyer and Jonathan Marvel, both principals at NY-based firms with deep roots and family in Puerto Rico, have started the lengthy work of targeted solar solutions for the island's residents. On September 19 and 20, Hurricane María, one of the most powerful storms in recorded history to cross Puerto Rico, left a trail of destruction across the island from southeast to northwest. The hurricane was responsible for over 35 deaths and catastrophic damage to buildings, infrastructure, and the landscape. Fortunately, our San Juan office, housed in a building designed by Thomas Marvel and José R. Marchand-Sifre, survived unharmed and was able to restart operations within two weeks. Commercial internet communications and water were restored within days and electricity is being provided by our own generator. Regular electricity and telephone services are not yet being provided. Because power, water, and telecommunications are still not available to most people on the Island, our office has become a hub for colleagues and friends to restart their professional lives after María. Our San Juan office is also the operations center for the Resilient Power Puerto Rico relief effort, co-founded by Jonathan Marvel, Cristina Roig, Walter Meyer, Jennifer Bolstad and other colleagues immediately after the storm.